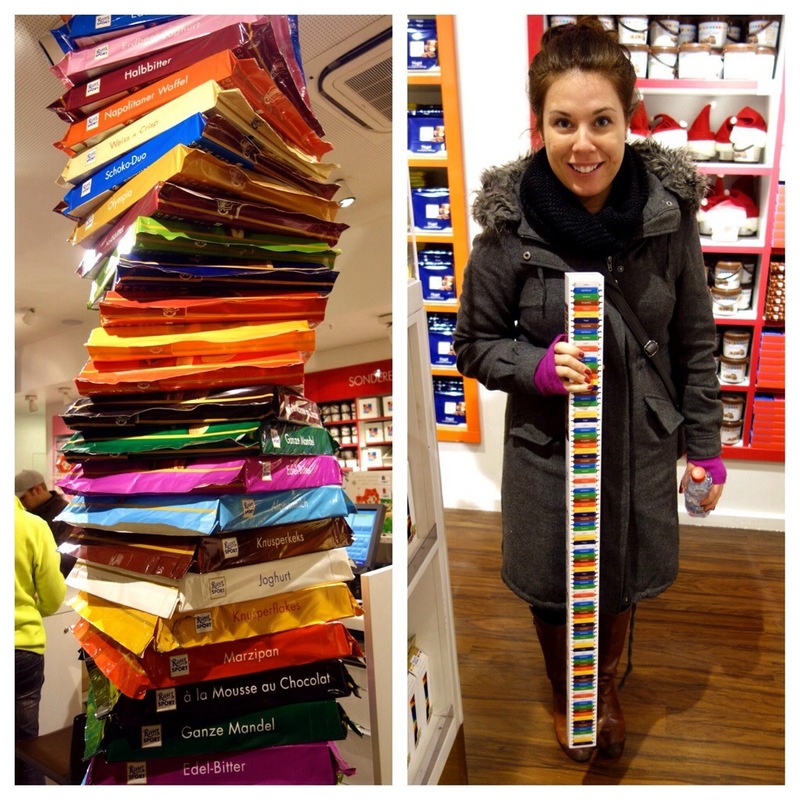 Ritter Sport and a Reminder to Choose Adventure – Where Did Mary Go? My mottos for this several-month-long enrichment of life has been “choose adventure,” and being sure to answer with an enthusiastic “YES” when presented with an invite to do just about anything, but sometimes I need gentle reminders. On the way to Gendarmentmarkt Christmas Market in Berlin one late afternoon in December, Andrew and I wandered down quiet Französische Straße and stumbled upon what looked like a Ritter Sport storefront. From the sidewalk across the street, I stood there thinking about the beginning of my obsession with their marzipan bar during a visit to Vancouver, BC a few years back. I hadn’t realized these little squared chocolate bars originated in Germany over one hundred years ago. Andrew said “let’s go check it out,” but I was anxious to see the holiday stalls at Gendarmenmarkt plus we had already purchased two Ritter Sport bars the night before from a little supermarket by the hotel. Wait, what? Who says no to chocolate?? If he had listened to me say “nah, I am not interested in going in,” we would never have experienced the joy that colorful little shop can bring. He gave me a disapproving look and proceeded to drag me across the street and inside the doors to a chocolate paradise that even Willy Wonka would have appreciated. Andrew and I settled on two bars. The first was milk chocolate with strawberry pieces, banana crisps and cornflakes. The second, a dark chocolate base with dried sour cherries, biscuit bits and gold stars. Much like choosing froyo toppings and nail polish color for manicures, I am crippled with so many options! I could spend a good hour or more just debating such choices in my head. Like it is the last ever time I will be able to make that selection and it must be perfect! Silly, isn’t it? Maybe swift decision making should be a goal for 2014. After taking our order for the bars, the chocolate maker tells us it will be about 30 minutes until they are ready. 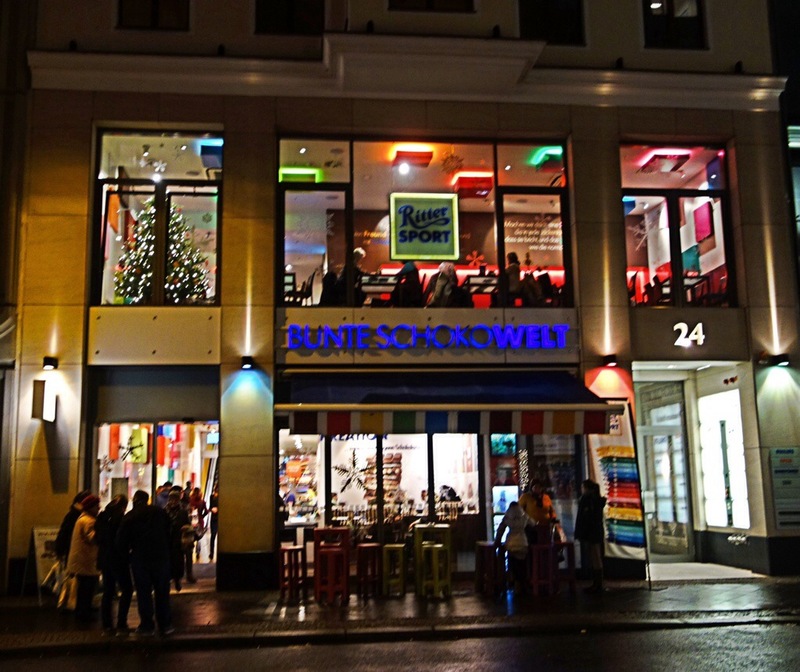 So we ventured back to browse the retail area, where you can find and purchase just about every flavor & size Ritter Sport bar imaginable, before heading upstairs to the SchokoCafe. My original intention was to simply warm up with a cup of tea, but once I spotted chocolate fondue on the menu, there was no turning back. This would be our dinner. 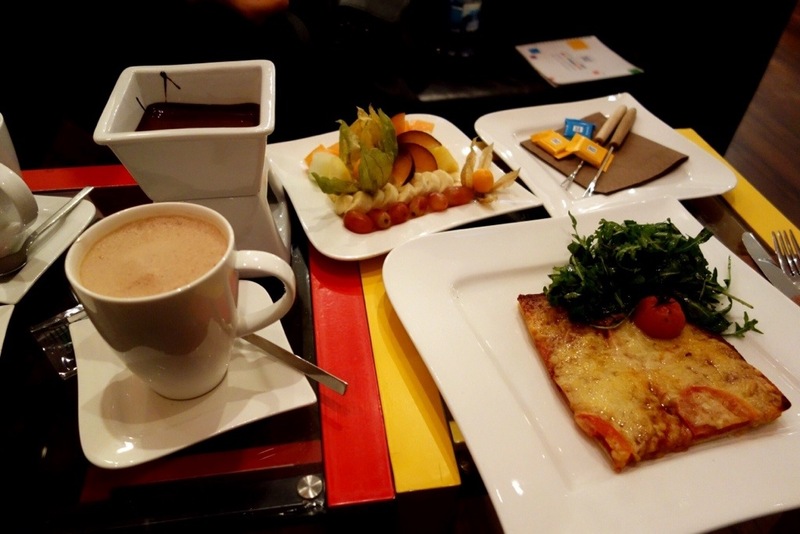 We ordered fondue to share, along with a slice of pizza for Andrew ((which came with a side of greenery for me)) and a warm drink for each of us ((I had chamomile tea & Andrew’s drink was a peppermint hot chocolate)). Made with Ritter Sport dark chocolate of course, the warm fondue was divine coated over bananas, plums, apples, grapes, and a new favorite fruit physalis. I sat there, smiling with chocolate coated lips thinking why did I ever not want to come inside this place?! 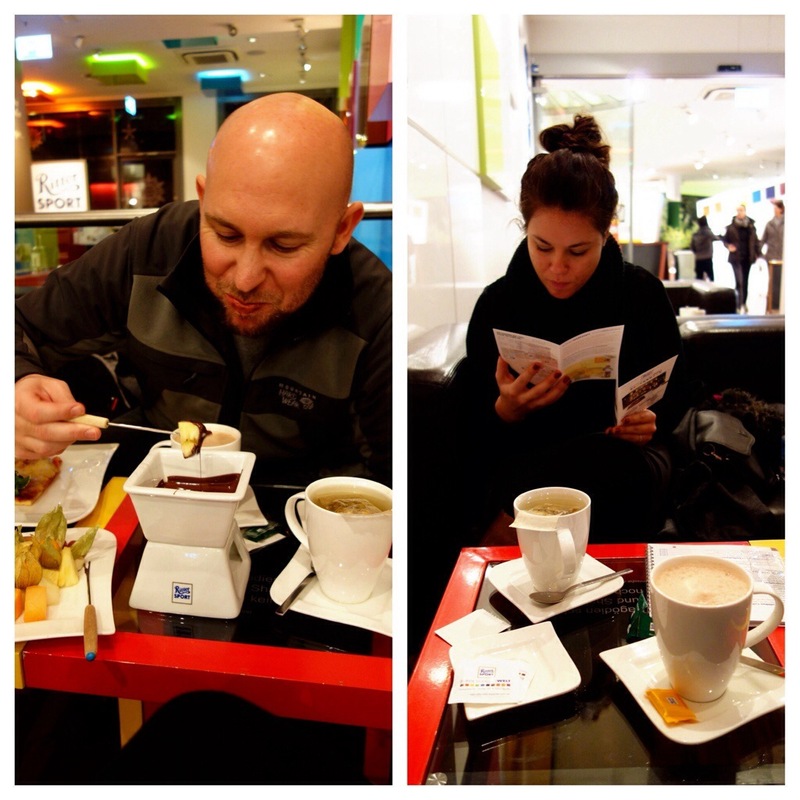 After relaxing in the cafe, we returned to the lower level to collect our chocolate bar creations which were placed inside a brightly colored box along with the ticket which details the ingredients. Off we went to the Christmas market with a full belly and happy heart from the spontaneity and joy of entering the doors of the Ritter Sport shop. If there is ever a reminder to choose adventure and say “yes,” this was it. Adventure doesn’t have to mean skydiving or an expensive trip to Dubai. It can be saying yes to the littlest things. I wish you many moments of choosing adventure this new year, big and little. 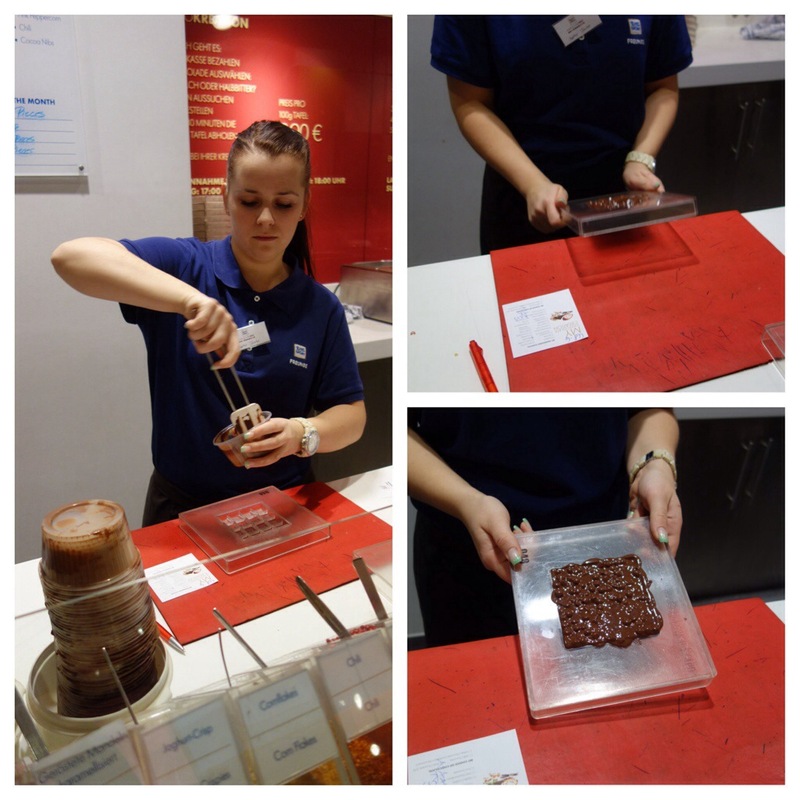 Oh…and in case you are wondering…the chocolate bar creations turned out to be delicious! I usually prefer dark chocolate, but it’s worth mentioning the milk chocolate with the dried fruit pieces and crunchy cornflakes is a winning combination. 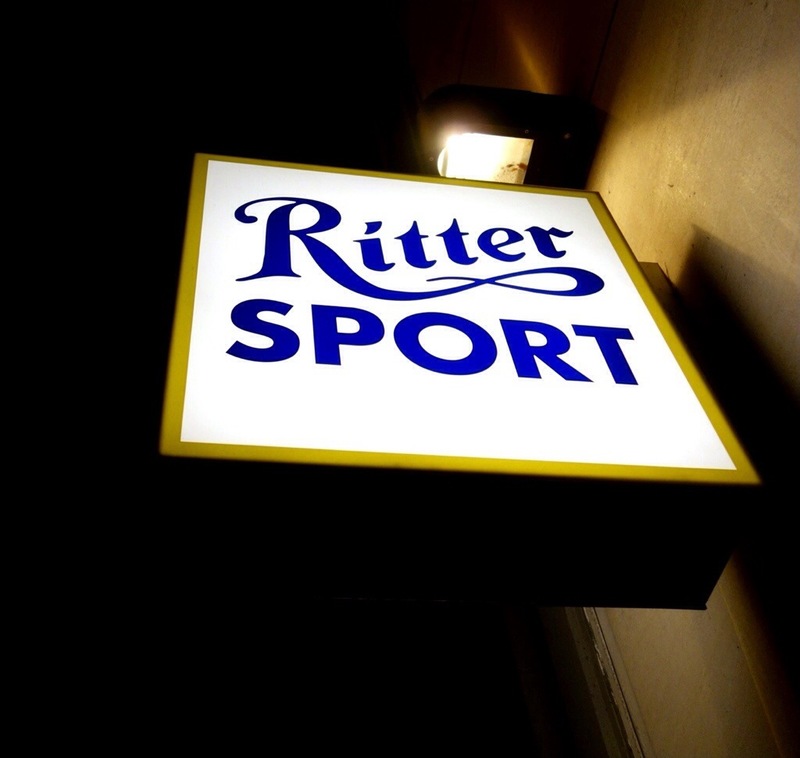 Have you ever tasted a Ritter Sport bar? Which flavor is your favorite? 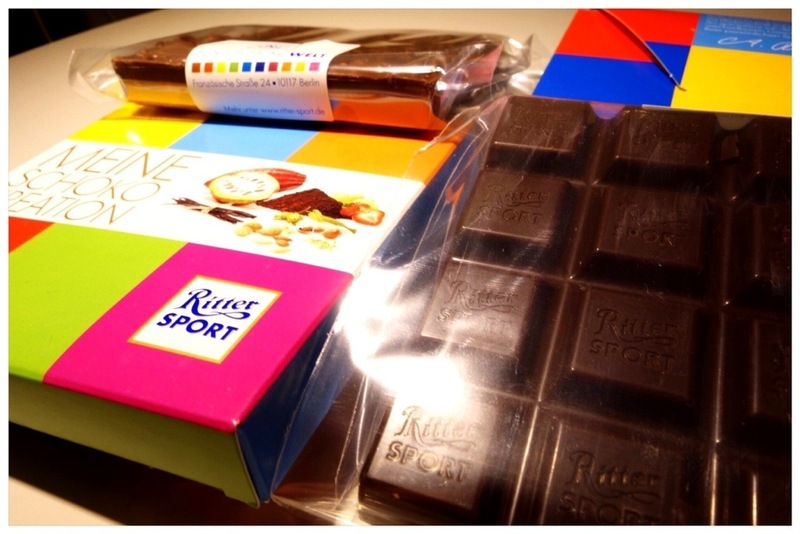 Ritter Sport is my favorite chocolate, ever! My favorites are the coconut and whole hazelnuts as well as the hazelnut nugget. Actually, I haven’t had one I don’t like 🙂 I think I will plan a trip back to Berlin just for this shop! I was there last year, but didn’t know the shop existed. Great pictures! I’ve also yet to have one that I didn’t like. There were so many options I’d never heard of in the retail part of the shop. 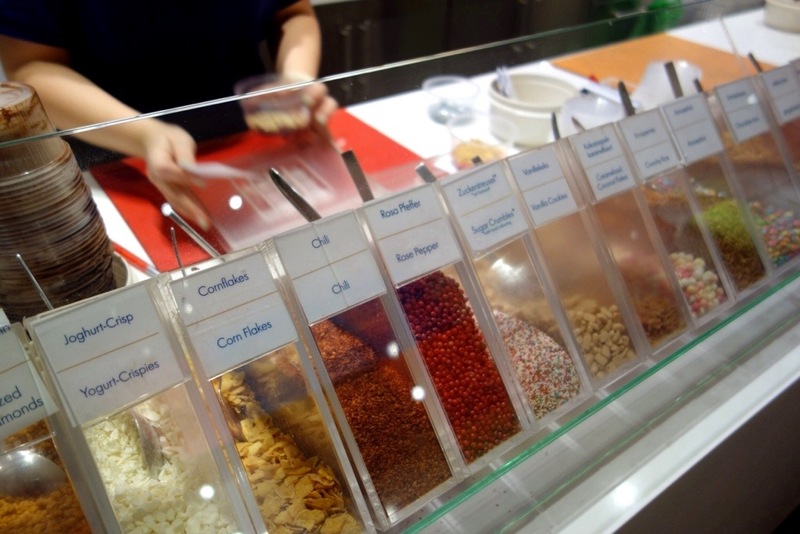 Try the cornflakes one if you come across it – it has that salty/sweet/crunchy combination that is brilliant. I’m amazed I hadn’t read about this place on more blogs. Quite the hidden gem! I hope you go see it for yourself! Great find! I’m with you on the marzipan – and taking forever to analyze every decision. Been honing the skill of acting on “gut instinct” and am getting better at it! Living dangerously! 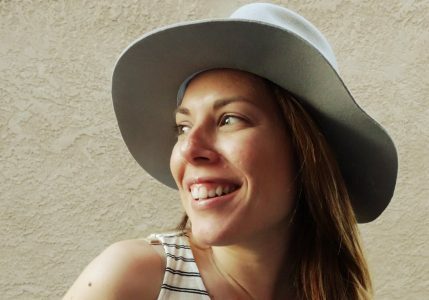 We’ve had similar experiences in California when we came across the Jelly Belly factory, Boudin Bakery, and Cowgirl Creamery (with cheese made in our hometown that we didn’t know about). So much fun! I’ll remember to keep saying “yes” to adventure – typically not a problem for me! Keep posting! Did you buy pounds and pounds of belly flops? !